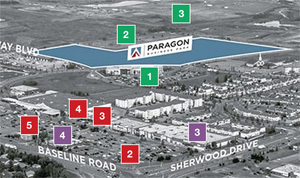 Hungerford Properties has built the Nexus, Northwing and Fairmore commercial condominiums in Calgary and is now launching Paragon Business Park in Sherwood Park, just east of Edmonton. “The attractiveness of commercial condos is that, with a low interest environment, small business owners who are driven by different motivations than larger companies see real value in ownership,” said Hungerford partner Michael Hungerford. The first phase of the development will feature an office building and warehouse comprising 121,000 square feet of leasable space on 11 acres near major transportation routes. The location will include more than 570 parking stalls and bicycle racks and is accessible by public transit. Site-clearing is complete and Hungerford is waiting for final permits so construction can begin. It’s scheduled to be finished next year and Hungerford said the project will grow according to market demand. The 35-year-old Vancouver company is partnering with architecture and interior design consulting firm Riddell Kurczaba, Edmonton-based builder Chandos, real estate services firm Avison Young and property manager Veritas Management Services on the mixed-use, campus-style development. Hungerford said Paragon should appeal to a broad spectrum of small and medium-sized companies from a variety of sectors looking to take advantage of the flexibility offered by the business park. While not immediately targeting LEED or other sustainability certifications with Paragon, all Hungerford projects go through an internal environmental review that seeks out best practices and takes the desires of local municipalities into consideration in case there are incentives in which to take advantage. Hungerford said the energy efficiency of the Paragon building envelopes will be superior to existing structures in the area. Extensive glazing systems and high-efficiency lighting will be incorporated, while native landscaping will be used on the property, even though Hungerford claimed small business owners generally don’t prioritize environmental features to the same degree as larger corporations. Companies committing to Paragon early on can benefit from both greater selection and lower prices as part of the selling strategy devised by the real estate investment, development and management firm. Privately held Hungerford has developed and refurbished millions of square feet of residential, office, retail and industrial properties across Western Canada, and manages a portfolio of diversified assets. Hungerford is responsible for building the sold-out, 450-plus-home MacPherson Walk community in south Burnaby, B.C. The company’s other commercial projects include Calgary’s Icon Business Park and Edmonton’s Ledgeview Business Centre.